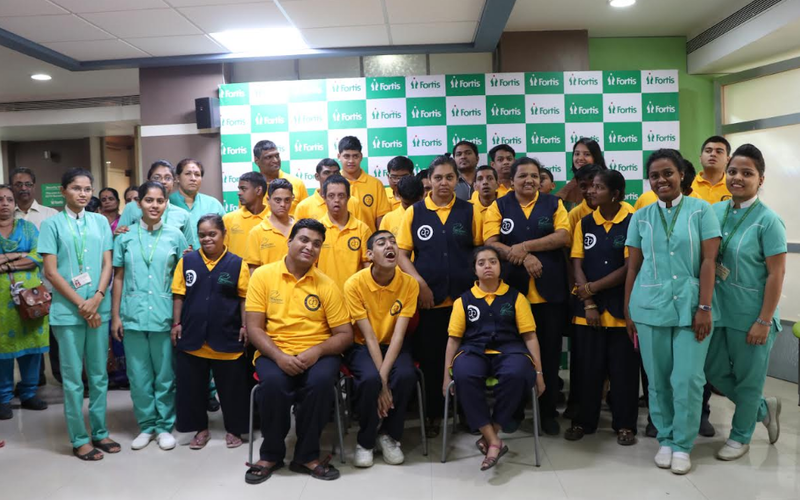 In observance of World Disability Day 2018, Fortis Hospital, Mulund organized a health check-up camp in association with Jagruti Palak Sanstha for differently abled children at the hospital. Over 55 children underwent a complete body screening which included Body Mass Index (BMI), Random blood sugar (RBS), Blood Pressure (BP), Hemoglobin (HB), Eye & Dental checkup. Consultations were hosted with Physicians, Gynecologists and Neurologists at Fortis Hospital, Mulund. Dr Shruti Sonar, HOD-Physiotherapy and Dr Kedar Tilwe, Geriatric Psychiatrist at the hospital hosted a talk on 'Ergonomics and Behavioral Management' for the parents who accompanied their children for this camp. The activity was graced and supported by Ms. Samashri Bhosale, Founder, Jagruti Sanstha, Mr Anil Joshi, President, Rotary Club (Thane), Mr. Prashanth Pawar, Senior Police Inspector-Thane and Mr. C R Ramakrishnan, President, Rotary Club (Bhandup).